The lifetime of Leon Detroy spans many movements and “isms”, but Detroy remained anindependent all his life. Although he belonged to no specific group, his landscape paintings reflect the flavor of Impressionism, others suggest Pointillism, and still others are strongly Fauvist in color. As early as 1905, A. Willette wrote of him, He belongs to no master, to no school. His roots, however, were strongly embedded in the country. His grandfather, Felix Detroy, was a winegrower of Azay – le – Rideau. Leon Detroy was born in Chinon in Touraine in 1858. His father was a doctor at Azay-le-Rideau and his maternal grandfather, Gilles de la Tourette, had been a surgeon in this village. The artistic influence in Detroy’s life stemmed from his maternal uncle, Leon Gilles de la Tourette. This gentleman, a major collector and amateur archaeologist, lived in nearby Loudun, and knew both Corot and Courbet. At the age of twenty Leon Detroy went to Paris to study painting and there with his friend, Albert Lebourg (who would soon establish himself as the Master of the School of Rouen), he founded the Jean-Paul Laurens Studio. They soon rejected the dry academic teaching and demanded lessons from nature. When a commission from the painter Charles Conte to make a copy of Rembrandt’s Draperies took him to Amsterdam, he read George Sand’s Promenade Autour d’un Village. This book deals with Gargilesse, a village in the Indre in Central France, “a little Gallo-Roman town sleeping in the valley watered by the cascading Gargilesse River”, as Andre Villeboeuf, painter and pupil of Leon Detroy, described it. In fact we are indebted to Andre Villeboeuf for many details concerning Leon Detroy’s life for, were it not for this devoted friend, we should know much less of him than we do. George Sand’s book had a strong influence on Leon Detroy’s life for, having read it; he left Amsterdam almost immediately for Gargilesse. He fell in love with this village of the Berri countryside and settled there. He lovingly painted this little village as well as Gresselines and Crozant, which are in the immediate vicinity of Gargilesse. He bought a house in the village and traveled throughout the area painting, his easel slung across across his back en bandoulière. He did however make yearly painting trips to other places: Venice, Bruges, the Balearic Islands, Corsica, Sicily and Rome. In spite of his retreat to the country, Leon Detroy enjoyed the friendship of other painters. Guillaumin, Monet, Vuillard, Bonnard and Segonzac were his close friends. It was Detroy, who persuaded Guillaumin to visit the Creuse, which he did not know at the time. 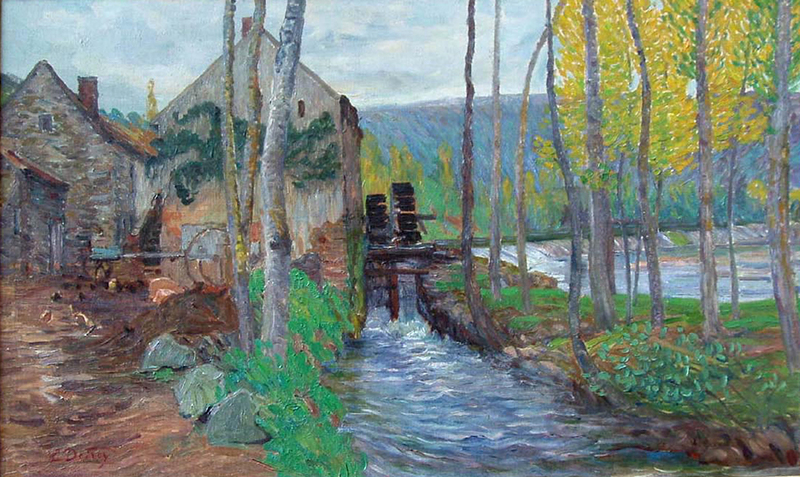 Guillaumin thus eventually painted for long periods on the Creuse, at Crozant. Detroy’s painting was inspired by his own joy in living in the midst of nature whose beauty and form he understood and knew how to render faithfully and effortlessly. Though he concentrated mainly on landscapes he also painted a number of still lifes. Examples of his work from the turn of the century show his awareness of his contemporaries among the post-impressionist avant-garde. Even in his old age, he painted with youthful enthusiasm. His painting is natural, sensual and supple and stems directly from the old French tradition. Though a spirit of independence ruled Detroy’s life, he may be placed among the Post-Impressionists, the neo-Impressionists who were contemporaries of Signac. His withdrawal from Paris, his refusal to seek fame and his own great modesty had, for a time, prevented collectors and the general public from being aware of the beauty and value of his work, but after his death he began to receive acclaim in international art circles. He now has a choice place among the artists of his generation.